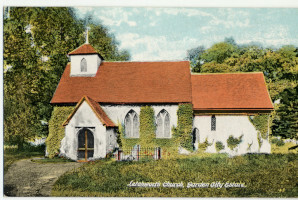 When Letchworth was founded as a garden city in 1903, there were three churches present in the villages of Norton, Willian and old Letchworth. These were St Nicholas, All Saints’ and St Mary the Virgin Church respectively. These Church of England churches had served their small communities since medieval times and still continue to serve in their respective parishes to this day. Colour postcard of St. Mary the Virgin Church. However, it soon became apparent that the three village Churches could not cater to all the spiritual beliefs and needs of new residents. As Letchworth’s population grew, many of the first religious meetings were held in private houses or in ‘The Sheds’ down Nevells Road. These temporary wooden shed structures were constructed to house the ‘unemployed London Workmen’, brought to the garden city in 1904 to dig roads and sewers. 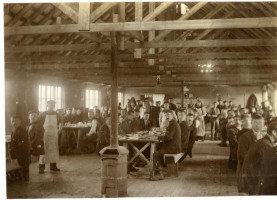 As work progressed, some of the sheds became vacant and were used for a variety of spiritual meetings and educational classes. The first Church building to be constructed in Letchworth was the Free Church Hall in 1905. Built by Baptists, Presbyterians, Congregationalists and others, the Free Church Hall demonstrates a strong community spirit, integration and shared aspirations to make Letchworth a place of religious freedom. Amazingly it was opened within a year of the plans being made, with most of the labour for the Church being undertaken by volunteers. 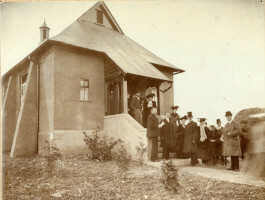 Opening of the Free Church Hall, 1905. 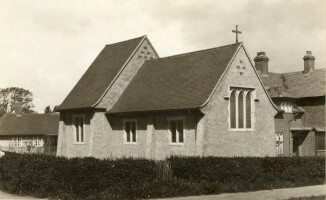 Following the success of the Free Church Hall, other Churches were built to accommodate the growing population and spiritual diversity of the new garden city. 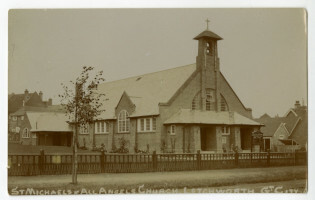 St. Michael the Archangel was built on Norton Way South in 1907 as a result of Canon Heazell’s persistence. 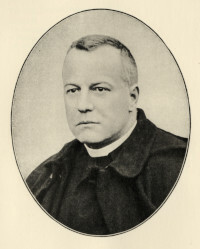 Canon Heazell was the first Rector of the garden city and his ministry continued through the war until 1918, when Reverend G. K. Olivier, father of Sir Laurence Olivier, succeeded him. Other churches built during Letchworth’s early years include St. Hugh of Lincoln on Pixmore Way (1908), the Primitive Methodist Church at Broadway (1914), Howgills Friends Meeting House (1908) and the Wesleyan Methodist Church at Norton Way South (1914). St Michael's Church, Norton Way South. This Church was demolished in 1969, after the new St. Michael’s on Broadway was built. The Primitive Methodist Church, which was pulled down in 1960’s. The Wesleyan Methodist Church, at the corner of Norton Way South and Pixmore Way. 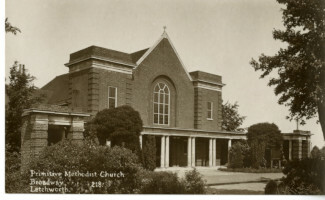 It became the Central Methodist Church when both Methodist Churches were amalgamated in 1937. There were many notable figures that brought a varied set of values and beliefs with them into the new garden city. They led the way in establishing community groups and societies, helped with the development of spiritual buildings and had a great influence over Letchworth’s reputation as a liberal, free-thinking and happy town. One of these pioneers was Reverend Bruce Wallace. Originally based in London, Wallace founded the Brotherhood Church and the ‘Brotherhood’ journal. He was also one of the founders of the Fabian Society and was a strong supporter of the Garden City idea. Wallace was one of Letchworth’s earliest residents, he lived in the Quadrant and held a religious gathering every Sunday evening in Howard Hall. Following the establishment of the Brotherhood Church, Wallace founded the Alpha Union Society, which held many of their meetings at the newly established Cloisters building. Wallace believed that man was a spiritual being and that diet played an important part in living a truly spiritual lifestyle. He lived on a diet of wholemeal bread and fruit and resided in a simple fashion. 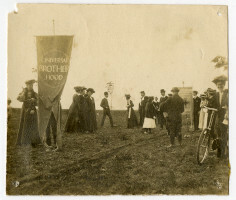 Photograph of the 1909 May Day pageant. Annie Lawrence stands by the ‘Universal Brotherhood’ banner. Another notable religious pioneer was Reverend Dr. Adrian Fortescue. A Catholic priest with three doctorates, Fortescue could speak eleven languages and was a highly skilled artist, calligrapher and musician. In November 1907, he was appointed Missionary Rector of Letchworth. With no Catholic Church to preach in, he utilised the ‘The Sheds’ on Nevells Road and the first public Mass was held there on 29 November 1907. Fortesque was determined to establish a permanent Catholic Church in Letchworth, but unfortunately his early death on 11 February 1923 prevented this. However, he did manage to establish a temporary Church in Pixmore Way, which was designed by the renowned architect Sir Charles Spooner and opened on 6 September 1908. The Church and its fittings reflected Fortescue’s interest in the Byzantine Church and his friendship with members of the Arts and Crafts movement. The new permanent St. Hugh of Lincoln Church would not be opened until 21 February 1963. Annie Lawrence was another spiritual pioneer, who moved to Letchworth from London in 1905. The terrible living conditions she had witnessed inspired her vision of an open-air school. This school would be dedicated to psychology, where students would be encouraged to study ‘how thought affects action and what causes and produces thought’. Through healthy outdoor living, it was intended that the students would develop healthy minds. The architect William Harrison Cowlishaw made Lawrence’s dream a reality and ‘The Cloisters’ was opened in 1907. The building was designed to hold lectures, conferences, drama and musical performances as well as organ recitals. 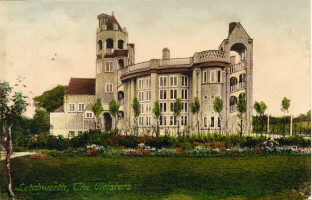 Colour postcard of The Cloisters, c.1915. Open-air swimming at The Cloisters. The Liberal Catholic Church of St. Alban in Letchworth was built in 1923 and is situated along Meadow Way and Norton Way South. The liberal Catholic Church is one of approximately thirty Catholic Churches in the world which are independent of Rome, such as the Greek Orthodox, Coptic, etc. It uses many elements of Catholic worship, but has no organisational connection with the Roman Catholic or Anglican churches. Liberal Catholicism is a relatively small Church, thus making the Church of St. Alban an intriguing and rare institution. The Liberal Catholic Church was founded in 1916 through a reorganization of the former Old Catholic Church. The movement was led by Bishops James Ingall Wedgwood, grandson of Josiah Wedgwood, and the Theosophist Charles Webster Leadbeater. Many of the early Liberal Catholic priests and Bishops were also Theosophists. Theosophy has very strong roots in Letchworth’s history. Vasanta Hall, Gernon Walk, was built in 1914 for the Theosophists of Letchworth. Hope Rea, an early Letchworth citizen, was a loyal member of the Theosophical Society. She took a key interest in educational and social reform and was a strong advocate of the Garden City. 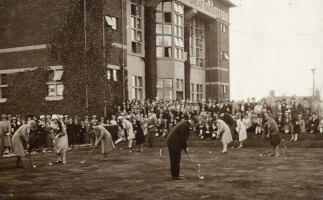 In 1907 Rea moved to Letchworth and subsequently laid the foundation stone for Vasanta Hall. She was also involved in the establishment of the Garden City Theosophical School (now St Christopher School). Both Letchworth establishments were supported by key Theosophist figures, such as Annie Besant. Today, Vasanta Hall is the ‘Letchworth Spiritualist Church’ and has been home to the Spiritualists since the 1970’s. 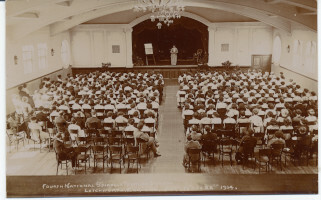 Interior of Vasanta Hall, c.1930. After a decade of growth, Letchworth was in need of more spiritual buildings. Many of the Churches built when Letchworth was founded were only supposed to be temporary structures, for example, St. Hugh of Lincoln, the Free Church Hall and the wooden hall used by the Baptists at the foot of Spring Road. As houses were built in the roads surrounding Broadway, it was realised that a more central place of worship was needed. Plans were drawn up for a large Gothic style Church and connected hall. 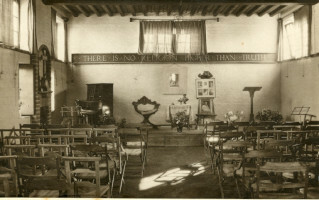 The hall was opened at Common View in 1915, but there was no church. Despite this, the hall was used for Anglican worship throughout the Interwar years. Today, it is the Norton Parish Centre and is used for events, sports activities and meetings. 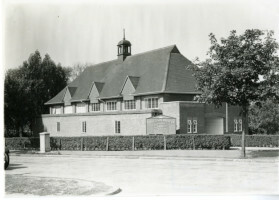 After the Second World War, the Grange estate was developed and the need for a new church became more urgent than ever. Throughout the 1950s and early 1960s funds were raised from local inhabitants who contributed on a weekly basis to build their own church, which became St. George’s. The Architect of the new St. George’s at Norton Way North was Peter Bosaquet of Oxford, who had also designed the Church at Hatfield new town. The Church was consecrated on July 27th 1964 by the Lord Bishop of St. Albans. Its 120ft white concrete spire is specially intended to be a symbolic landmark for the neighbourhood, while the interior, including a hexagonal-shaped nave, is designed to express a stronger relationship between Altar and people. When it opened, the design of St. George’s was seen as revolutionary and it was called ‘Space-Age’ by many journalists. The work of the Baptists flourished in the Interwar years. They utilised a wooden hall at the foot of Spring Road that was previously inhabited by the Elim Church. By the early 1930’s, a full series of meetings were held on Sundays and Thursdays, plus there was a growing Sunday school. 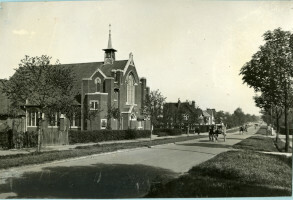 As a result of local collections, the new Baptist Church was opened ‘free of debt’, on the corner of West View and Broadwater Avenue, on 27 November 1935. 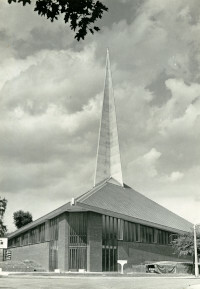 After World War Two, the first Church to be built on the new Grange estate was for the Baptist community, opening in May 1963. Over 200 people attended the opening, which was led by Howard Morriss, a prominent member of the Letchworth Baptist Church. Some had to listen to the dedication service through loud speakers due to the large turn-out. Morriss was handed the keys to the door by Courtenay Crickmer, the architect who designed the church. Money for the Church’s construction was gathered through donations from the early 1950s. 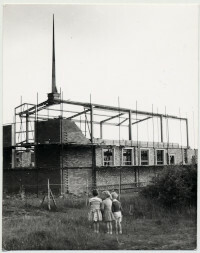 Grange Estate Baptist Church during construction, c.1962. The Elim Church was another that grew during the Interwar years. In 1922, a handful of people met every Thursday night in a little room down Common View for Bible study. These people were already attached to various denominations and had no plans to set up a new church or sect. Their common desire was to learn about the deeper truths to be found in the scriptures. As the group expanded, plans were made for an evangelistic campaign to be held in the Iceni Hut in Nevells Road. This mission was conducted by Pastor George Jeffreys, founder of the Elim movement. After three weeks of campaigning, a decision was made to build ‘Elim Hall’, a wooden structure that could hold 150 people. As the attendance of services grew steadily, within 18 months it was necessary to extend Elim Hall by twenty feet in length. Meanwhile, a permanent Church was built on Norton Way North. This new Elim Church, designed by Cecil Hignett, opened on 10 June 1927. Today, the Elim Church of Letchworth is based at The Icknield Centre, Icknield Way and is known as the Letchworth Garden City Church. It is part of the Elim Pentecostal Churches of Great Britain, a growing movement of 550 Christian congregations in the UK and Ireland. Very recently the original Elim Church, Norton Way North, opened as a Montessori School. After war broke out in 1939, many Londoners were evacuated to the countryside. North Hertfordshire provided a safe haven for evacuees and Letchworth was a popular destination. There was an increase in the Jewish population of Letchworth between 1939 and 1945 as a direct result of this mass migration. The Letchworth Jewish community had the infrastructure that normally accompanied much larger communities, such as a kosher butcher, mikva, Talmud Torah, etc. This new community was led by Aba Bornstein, one of the leaders of the Misrachi movement. He developed the Hallmead and Mullway estates for Jewish workers, who were mainly Ashkenazi Orthodox, originating from Stamford Hill and Golders Green. Places of worship for the Jewish community throughout the war included a Synagogue at 40 Hallmead, The Letchworth Hebrew Congregation (Kahal Adass Yeshrun) at 62 Mullway, The Letchworth Talmud Torah, Scouts Hill Synagogue at Icknield Way and Simmons’ Hall Synagogue at Station Place. All of these establishments catered for the Ashkenazi Orthodox community and most closed after the war ended, except the Letchworth Hebrew Congregation, which continued to function until 1971. The closure of many Jewish establishments was a result of the majority of the community departing Letchworth for Jerusalem or other parts of the United Kingdom. Today, Letchworth’s spiritual diversity is evident in the more recent establishment of a Buddhist, Temple, a Sikh Temple and the Letchworth Islamic Society. More Christian Churches have been established in the last twenty years, including King’s Community Baptist Church which opened on the Jackmans Estate in 1997 and the New Life Church, founded in 1990. Please visit our themes page for more information on Spirituality and Belief or book a place on one of our Collections Explorers handling sessions. The Spirella Company was one of the biggest makers of high quality corsets. 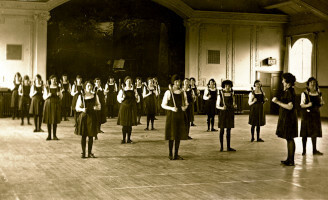 The company had a motto, ‘Healthy Happy Workers are the World’s Best’ and staff welfare was a priority through good working conditions and leisure facilities. Unlike other companies their corsets were made to measure and were not sold through shops. A network of ‘corsetieres’ across the country sold Spirella’s products direct to the client in the comfort of their own homes. 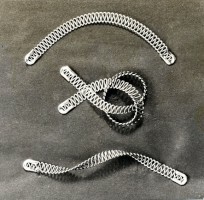 The Spirella story starts in America in 1904 when Marcus Merritt Beeman invented the revolutionary Spirella Stay, which he made from tight spirals of piano wire. Stays are the inserts that give corsets their structure. Until Spirella, they had either been made out of whalebone, which was expensive and broke easily, or steel, which was not very flexible. Beeman and two associates, William Wallace Kincaid and Jesse Homan Pardee, set up the first Spirella Company, in Meadville, Pennsylvania, USA and the company quickly expanded internationally. In 1909, Kincaid came to the UK in search of a suitable place for a factory and met Ebenezer Howard. 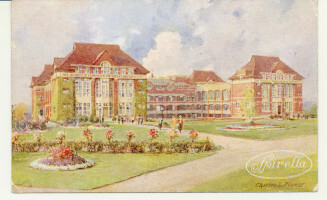 Kincaid was impressed with Howard’s Garden City principals, which were similar to Spirella’s own, and chose to establish a factory in Letchworth. A bold move as Letchworth was still very much a pioneering experiment at the time. The Spirella Company factory was designed by the architect Cecil Hignett and built between 1912-1920. In keeping with their American factories, Hignett was: “to provide unbroken and well illuminated working spaces with good access and with provision for future expansion”. 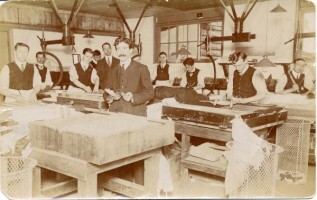 Production started in March 1910, whilst the factory was being built, and so the workforce were temporarily accommodated in wooden sheds in Nevells Road. The sheds were originally built by First Garden City Ltd. to temporarily house labourers who were employed to construct the Garden City. Working conditions were cramped, with poor lighting and little warmth. On top of that, the buildings were also shared with numerous rats and there would often be a shriek throughout the workroom as one scurried under the desks! Apart from the Spirella stay, the company’s success was largely based on their unique sales method. Trained corsetieres were employed to be the contact between designer and client. Each Spirella corsetiere bought corsets from the Company at wholesale prices and supplied them to their customers at retail prices. This meant they were each responsible for their own income. 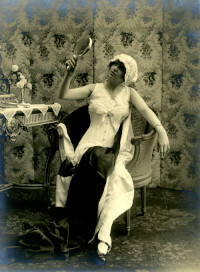 The role of the Corsetiere was unique – never directly employed by the company, they were later renamed Spirella Fashion Consultants. Spirella’s first product ranges in 1910 were back and front laced corsets and a range of blouse extenders and bust confiners to fit in with the fashionable tubular figure shape. 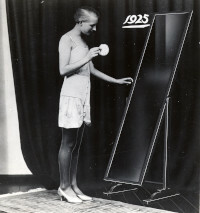 By the early 1920s the boy-like flat figure with no visible bust or waistline was fashionable and bandeau brassieres were added to the range to flatten the bust. The 1930s saw many new styles of lingerie and hosiery introduced alongside new styles of corset and brassieres. The corselette, a one piece garment, which brought together the girdle and the brassiere, was popular during the 1930s, helping women to achieve the long flowing line of the movie stars. The 1960s saw the introduction of made-to-measure swimwear and ‘Match Makers’ co-ordinated fashion wear, as well as a short-lived cosmetics range called ‘Beauty Match’. Further ready-made underwear became widely available from 1968 with the Coppelia range. Spirella’s philosophy and management were perfectly in tune with the ideas of Ebenezer Howard and the early Garden City pioneers. Each department had plenty of space, light and ventilation to give its employees the best possible working environment and conditions. 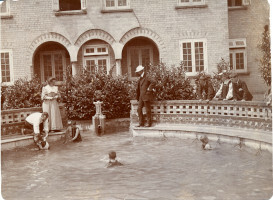 Before the introduction of the welfare state, Spirella took a rare protective attitude to its staff: providing health and recreational facilities. The company paid 50% of employee’s medical bills and also paid for a bed to be permanently kept available at Letchworth Hospital for any staff requiring serious treatment. 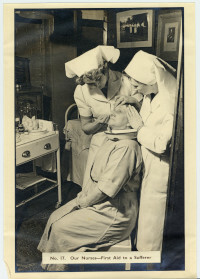 To encourage workers to look after their eyes and teeth, optical and dental treatments were also subsidised by the company. 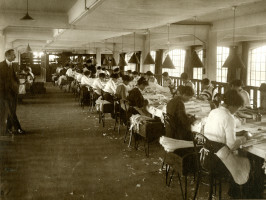 In the factory there was a rest room with on-site nursing which provided medical and first aid treatment for all employees. There were also library facilities, bathrooms, a roof garden and those cycling to work benefited from in-house repairs should they get a puncture! The mid 1960s saw a decline in the demand for made-to-measure corsetry and trading profits and turnover dropped. The Company was eventually taken over by Spencers in 1985. In 1988 orders had fallen to just 20,000 and the company closed in 1989. Please visit our themes page for more information on Spirella or book a place on one of our Collections Explorers handling sessions.